Check nearby locations for the services you seek. Settements: Emerald Bay Resort, The Forest, Farmers Hill, Harts, Mount Thompson, Ocean Addition W, Ramsey, Rolle Town, Rokers Point, Steventon. George Town International Airport is located nearby. Air service is available through George Town International Airport. 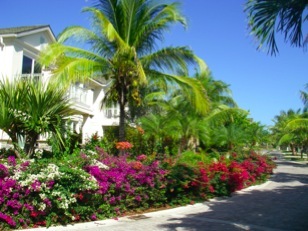 Located on the NE coast of Great Exuma Island, the area has undergone extensive recent development. The former Four Seasons resort hotel and marina reopened in January 2010 as a Sandals Resort. Exumas Visitors Guide. An free guide booklet available at many local businesses. It provides a good directory of services and attractions throughout the Exumas. Scotia Bank Bahamas, Emerald Bay. Feb 15: Bank & ATM are closed. Scotia Bank Bahamas, Ltd.; 242-336-4651. Farmers Hill. Bristol Wines & Spirits; 242-336-2834. Emerald Bay. Located in the shopping center near the marina exit roundabout. Coconut Grove Liquor Store; 242-358-0139 / 0138. Farmers Hill. Marina at Emerald Bay offers a book exchange in the cruisers lounge. 252-358-4060; Fax: 242-358-4063. Farmers Hill. Airport Car Rental; 242-345-0090. Airport. The Marina at Emerald Bay will arrange for a rental car to be brought to the marina for pickup and return. Feb 11: $75/day for a Corolla. Blessed Full Car Rental; 242-524-7532. Farmers Hill. Raquel's Car Rental; 242-358-5011; 242-357-0499. Rokers Point. There is a BTC tower at Emerald Bay. Cell phone service is excellent in the area. The marina offers coffee in the clubhouse from 0700 to 1100. There is a superb cruisers net on VHF Ch-72 each morning originating in George Town. Marina at Emerald Bay is a Port of Entry; 242-345-0073; open 7 days, 0900 to 1700. 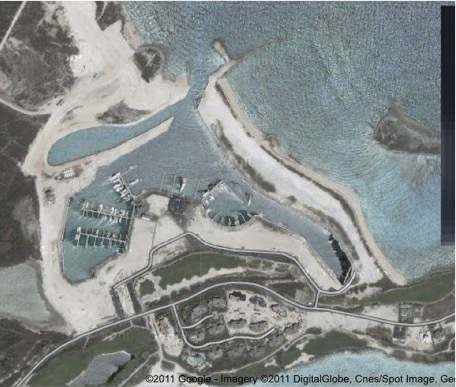 The Marina at Emerald Bay is a Bahamian Blue Flag Initiative marina. Bonefishing guide: Bonefish Reno; 242-345-5014; 242-524-4215; bonefishreno@yahoo.com. Rolle Town. Full and half-day excursions. Tackle & transportation can be provided. Marina at Emerald Bay offers diesel and gas. The fuel is extensively filtered. The Marina at Emerald Bay will accept waste oil for disposal. Adderley's Convenience Store; 242-358-8056. The Forest. Bowes Convenience Store; 242-358-0138. Ocean Addition W.
The Emerald Isle Supermarket is closed. Emerald Bay Marina is working on opening a convenience store in the marina office building. Grog Pond Hardware; 242-358-4147. Ocean Addition W.
Darville Lumber; 242-336-2980. Located about 3 mi. N of Lake Victoria is the local "Home Depot". Ice is available from the marina; check for current price. Marina at Emerald Bay has excellent free WiFi throughout the marina. Marina at Emerald Bay offers complementary use of washers (4) and driers (4) to marina guests. L&D Laundry Mart; 242-358-0130. Harts. The Bay Wash House; 242-345-6122. Rolleville. Blessed Full Room Rental; 242-524-7532. Farmers Hill. Grand Isle Resort & Spa; 242-358-5000; 242-336-6987; 888-472-6310; 561-350-3091. 1-4 bedroom luxury villas. Sandals at Emerald Bay; 888-SANDALS. The Palms at Three Sisters; 242-358-4040. Mount Thompson. Marina at Emerald Bay; 242-336-6100. A full service marina; offers diesel and gas; free wifi; superb clubhouse. See information below provided by the marina. Feb 2015: The marina is offering a special rate of $1.00/ft (40 ft minimum) for slips on the piers (D, I, J) that do not have electrical service (but do have metered water). This includes use of clubhouse facilities and wifi. Full service pier rates start at $2.25.ft. Check on special pricing for boat in-water storage for June through December. Many boaters have commented to me about the "surge" in the marina. Now that Onward has weathered several periods of >18 kt winds from the NNE to ENE quadrant (Feb 2011), I have experience with the effect. The marina itself is really well protected from wind and swells. That said, the area is large enough that winds do get over the enclosing arms of land intended for future home sites but it is attenuated from that in the Sound. The entrance shape and breakwater do a good job of knocking down the swells from the Sound and I've seen no real sea swell running in the marina. In fact, the waters look quite placid. But, the fact is under high winds from the NNE to ENE quadrant, boats move around a lot in their slips. After studying videos of Onward's motion and walking around and observing, I believe there are two factors that cause this motion of boats at the piers. The first is that the marina basin is a closed system with hard reflective concrete and stone walls all around it. It acts like a "water hammer" with what small swells do get in to the basin bouncing back and forth off the walls. Second, the floating piers while extremely well built are double wide with no pilings between them. Thus there is nothing to tie off the side of a vessel opposite that of the finger pier it is berthed to. This then requires the use of a lot of fenders and spring lines. I believe it is the reaction of the boat and lines with its fenders caused by the rather small movement of the water in the basin that gives the vigorous motion boats experience. The fact that this motion is not continuous but periodic (periods of quiet followed by a build up of motion with more and more compression of fenders until a maximum is reached then a damping out) supports my conjecture. I found by repositioning Onward in its slip so the bow was into the wind and then rigging crossed lines from bow and stern to my friends' boat that shared the slip made the motion "almost normal" for both of us. Caution: Use substantial chafe protection on all dock lines. Pharmacy: Smitty's Drug Store; 242-346-2411; located about 3 mi. S of area. This is the only pharmacy in the S Bahamas. John, the pharmacist, gets twice-weekly shipments of prescription drugs from Nassau. While he keeps a good stock of standard pharmaceuticals he may not stock special combinations available in the US. Your doctor can phone or fax in a prescription. If it is special, the doctor can consult with John by phone to see what alternatives may be available through Nassau. Looking NE out through the entrance slot. Entrance channel buoys looking out at the entrance channel. Buoy 7 is in the foreground and 1 and 3 are visible just above near the horizon. The entrance to the Marina at Emerald Bay is well marked by a series of red and green buoys. After passing the G1 & R2 buoys that mark the outer end of the entrance channel, it is necessary to turn to port (S) at G3 & R4 which are located just E of the line of the breakwater projecting out from the S side of the entrance. This will line you up with the cut through the bluffs into the marina basin. Note: February 2015, only the 2 red buoys were in place. This dogleg turn to port on entry makes access to the marina a bit challenging when the winds are out of the NNE to ENE quadrant at more than 15 kts. Under these conditions, the swells from the Sound will tend to push an entering vessel to starboard and toward the shoals along the shore. It is important to favor the port side of the entrance channel under these conditions. Under weather conditions with high winds > 15 kts from the NNE to ENE quadrant, it is suggested that a captain talk with the marina's Harbormaster about whether the entrance should be attempted. In Feb 2011, I witnessed a P 47 catamaran surf its way into the marina with winds NE @ 15-20 kts; so it can be done (but I don't think I would try it). Once through the slot in the bluffs, the marina has a large maneuvering basin that is well protected except from winds coming through the slot. Grand Isle Resort & Spa; 242-358-5000; 242-336-6987; 888-472-6310; 561-350-3091. Spa. Ida's Beauty Spot; 242-358-5005. Roker's Point. Sandals at Emerald Bay; 242-336-6800; 888-SANDALS. Spa. Total Transformation Beauty Barber & Supplies; 242-358-4068. Farmers Hill. Trinity Ultimate Cleaning; 242-358-4325. Farmers Hill. Marina at Emerald Bay can arrange for a propane truck to come on site to fill cruisers propane tanks. Grand Isle Resort & Spa; 242-358-5000; 242-336-6987; 888-472-6310; 561-350-3091. 1-4 bedroom luxury villas; Greg Norman golf course. The Resort offers daily passes to use the pool and beach at $35 / person / day. Oceania Heights Resorts Ltd.; 242-345-0187. Moss Town. Sandals at Emerald Bay; 242-336-6800; 888-SANDALS. (Formerly Four Seasons). 183 oceanfront rooms, suites, villas; spa; huge infinity pool; wonderful long crescent beach; Greg Norman golf course. Sandals offered half-day (morning or evening) and full-day passes that provide full access to the restaurants and amenities. Big D's Conch Spot; 242-358-0059. Steventon. An excellent beachside restaurant and bar well known for its fresh conch dishes -- don't miss it. Chat & Chew Restaurant & Bar; 242-358-4158. Farmers Hill. Emerald Bay Marina Club House: "Happier Hour": Every Monday 1730 - till. Exuma Point Beach Bar & Grill; 242-345-6244. Rolleville. A beachside restaurant and bar on a beautiful beach at the NE tip of Great Exuma. Offers All-you-can-eat buffets. Open on Saturdays and Sundays from 1200 on. Emerald Bay Pub & Grill. Just opened in February 2015 with a bar and grill; it is located in the Emerald Isle strip mall near the beverage store. There are daily food specials for lunch and dinner. Pallapa; Grand Isles Resort & Spa Pool Bar & Restaurant. A beautiful poolside bar and grill with a lovely thatched-roofed dining pavilion a short walk from the Marina at Emerald Bay. Breakfast, lunch and dinner (reservations for dinner are recommended) Great food & bar; bacon cheeseburgers; panini, blackened tuna steaks. The beautiful pool is reserved for Villa owners and guests only unless a $35 / person / day pass is purchased. Grand Isle Resot & Spa Pool Bar & Restaurant. Hill Top Tavern; 242-345-6006. Rolleville. Houseman on the Bay Bar & Restaurant; 242-345-7070. Mount Thompson. Ocean View Restaurant & Bar; 242-358-6299. Rolleville. Sistah's Place; 242-358-7133. Mount Thompson. 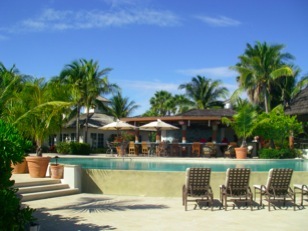 The Exuma Palms at Three Sisters Hotel & Restaurant; 242-358-4040. Mount Thompson. The Original Three Sisters Restaurant, Bar & Gift Shop; 242-345-7011. Mount Thompson. Ca'Merline's Fashion; 242-358-4242. Farmers Hill. Guys & Dolls #2; 242-358-4582. Farmers Hill. John Bull Limited; 242-336-6976. Emerald Bay. RBM Wholesale Depot; 242-358-7040. Mount Thompson. Unisex Boutique; 242-358-3133. Farmers Hill. The marina has some of the finest showers in the Bahamas for use of its guests. Sandals at Emerald Bay; 242-336-6800; 888-SANDALS; offers a complete PADI dive center with two dive boats. Blessed Full Car Limousine Service; 242-524-7532. Farmers Hill. Celebrity Limousine Service; 242-358-5011. Rokers Point. Marina at Emerald Bay will arrange for taxi service. Christine's Island Tours; 242-358-4016. Farmers Hill. Golf at Greg Norman signature golf course; a Sandals day pass is necessary. Grand Isle Resort & Spa; 242-358-5000; 242-336-6987; 888-472-6310; 561-350-3091. Feb 2012: offering use of pool and spa to cruisers for $35 / person / day. Sandals at Emerald Bay; 242-336-6800; 888-SANDALS. Half-day and full day passes are available for purchase. Trash receptacles are available for marina guests. There is no longer a veterinarian on Great Exuma. Standard Bahamas VHF Protocol: Ch-16 is for marine emergencies, safety, and hailing. It is also used by local Bahamian shore facilities for hailing. Communication traffic must be shifted to another channel. Marina at Emerald Bay Weather from Weather Underground. Marina monitors VHF radio CH 16, Working CH 11.
availability, and with the approval of the Harbourmaster . Day passes, 10am - 6pm: $180. Night passes, 6pm - 2am: $150. Golf may be played without a pass; green fee is $250. Spa may be use without a pass; pay per spa service. Arriving and departing vessels should notify the Harbourmaster. The Marina Staff is pleased to provide complimentary assistance with arriving and departing vessels. Please notify the marina staff of any special request or circumstances in advance. Check-In time for transient dockage is at 12:00 Noon. Check-Out time is at 11:00AM. Early check-in and late check-out times must be approved by the Harbourmaster. To expedite your check-out, please inform marina office the day before your check-out and request “express check-out”. Please be advised that we accept Master Card, Visa and American Express. Cash and checks are not accepted. If your guest card is misplaced or lost please notify the Harbourmaster office immediately. Please contact the Harbourmaster for billing questions. Customs and immigration clearance is available by raising your quarantine flag, and notifying the Harbourmaster. Marina Staff will provide your vessel with the necessary documents. Passports are now required. Daily from 7:00 AM to late afternoon in the Harbourmaster Lounge. Please contact the Harbourmaster for assistance with any issue regarding the utilities. Be advised that electricity and water are metered. Telephone service must be activated by marina office and billing is based on minutes used. However, cable tv, wi-fi Internet, and waste management services are included in our daily transient rates. The charge for pump out service is complimentary for members and $25.00 for non-members. Marina showers and bathrooms are open 24 hours and located behind the Harbourmaster building; both are complimentary. Complimentary laundry machines are located behind Harbourmaster Building. Please note these are front load washers requiring very little soap. This site lists current conditions at The Marina at Emerald Bay as recorded by our marina weather station. Contact the Harbourmaster for delivery of ice. The Harbourmaster will be pleased to assist with packages and mailing services. Packages being received should be mailed to the following address: The Marina at Emerald Bay, Attention: Harbourmaster, PO Box Ex-29005, Great Exuma, Bahamas. Be aware that mail coming from outside of The Bahamas can take over two weeks. We suggest using an express mail service. We will be happy to provide transportation to Mailboxes Etc. just a couple minutes from marina. You are welcome to use marina account at Mailboxes Etc. but financial transactions must be made directly with Mailboxes Etc. The Crew Lounge is located within the Harbourmaster building. The Lounge has a computer terminal, pool table, and television with DVD movies. Complimentary transportation upon request via our golf cart which operates from 8:00 AM – 11:00 PM daily between Sandals Resort, Grand Isle Resort, Emerald Market and marina. Cart is available next to Harbourmaster Office. Taxis and car rentals may be arranged at the marina front desk. Beach access to Emerald Bay may be made through Grand Isle Resort and Sandals Resort, or any public beach access area. Please refrain from using Sandals pool areas and beach cabanas unless you are staying in the hotel or on a one day pass. Please contact the Harbourmaster for information on access to swimming pools within Emerald Bay. Marina Guests are welcome to enjoy the Pallappa Restaurant & Bar located on the highest elevation level within Emerald Bay. Grand Isle Resort also offers direct access to the Emerald Bay crescent shaped beach which is the perfect place to enjoy snorkeling and water activities. Marina Guests are welcome to enjoy the public areas of this magnificent resort. Please be aware that Sandal is an all inclusive Resort and children are not permitted on property. Should you wish to visit Sandals to enjoy a nice evening or just get away, one day passes are available. Sandals Emerald Bay, an all-suite gem, offers a choice of Luxurious oceanfront accommodations. Guests can opt for beachfront villas or charming houses, all of which have furnished terraces or balconies overlooking Emerald Bay. Guest suites are decorated in rich, dark woods and rattan offset by pastel walls and sunny artwork. Golf tee times on the outstanding Greg Norman ocean course and tennis court reservations is also available. Sandals offers a wide array of spa treatments and salon services and entertainment daily. All reservations for Sandals must be made through the Resort. Departure tax is $15.00 for visitors ages six and older. A 10% hotel tax is imposed on hotel bills. There is no sales tax in The Bahamas. Electricity is 120volts, 60 cycles, AC. American appliances are fully compatible; British or European appliances will need both converters and adapters. English is spoken but sometimes with a marked patois. Liquor is sold in liquor stores and various convenience stores; it is readily available though not sold on Sundays. The legal drinking age is eighteen (18). Persons taking liquor outside of the country are allowed two liters of duty free alcohol. Eastern Standard Time is observed throughout The Bahamas and daylight Savings Time is observed. Some services have the tip included, others do not. If the guest feels the service is exceptional a 15% tip is customary. The tap water is safe to drink. It is supplied by our reverse osmosis plant. Bottled water is sold on the island. Service is available through the Habourmaster Office. Located in the Emerald Isle shopping center at the roundabout are a liquor store and a pub. Fueling operations are from 7:30 AM – 5:00 PM daily. To call The Bahamas from the U.S or Canada, dial 1-242 plus the seven-digit local number. From the U.K., dial 001-242 plus the local seven digit number. To make a direct international call from The Bahamas to the U.S or Canada, dial 1 plus the area code and local number. To place a call other countries, dial 011 plus the country code, the area code (usually without its initial zero), and the local number. For local call within The Bahamas, simply dial the seven digit number. To call from one island to another within The Bahamas, dial 1-242 and then the seven digit local number. Coin operated phones accept both Bahamian and U.S quarters. Most of these phones now accept calling cards, similar in appearance to a credit card, that come in denominations of $5, $10, $20 and $50. They can be purchased at the Harbourmaster Office. A public phone is located in the laundry room. Most likely your cell phone will not work in The Bahamas. You may rent a Bahamian cell phone from the Harbourmaster Office. Internet is available to your vessel via a wireless connection and Internet connection is also available within the Harbourmaster Lounge at a courtesy laptop. A selection of DVD movies and Board games are available at no cost for viewing in our TV lounge, or on your yacht. Please ask at Front Desk office. Marina reception desk sells toiletry items, OTC medications, feminine hygiene products, laundry soap and bleach. We respectfully request the cooperation of our guest to maintain the ambiance of gracious informality for which The Bahamas is known and the image of Emerald Bay Resort upholds. During the day while in Wahoo’s, Pallappa, Drunken Duck, Bare Foot shorts or a dry swimsuit with a beach wrap or a cover-up are perfectly acceptable. Footwear must be worn and gentlemen are expected to wear a shirt at all times. After sunset swimsuits are not permitted in the aforementioned facilities. Gentlemen are required to wear trousers, collared shirts and closed in footwear in Il Cielo. Ladies comfortably attire in cocktail length dresses, skirts or evening trousers. While sun bathing on your yacht please use your own best judgment. 8:00am – Noon (Sunday) Emerald Isle – near marina entrance. 9:00am – 6:00pm (Monday – Saturday) – near marina entrance. Eveningwear at resort restaurants is generally informal. Long trousers and collared shirts for gentlemen and summer dresses or long pants for ladies are appropriate. As a common courtesy, we recommend wearing shoes, a shirt and shorts and not swimwear while in the many island towns. 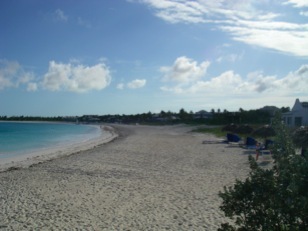 All beaches on Great Exuma are public property, as is Sandals beachfront. Swimming at night or alone is discouraged. All shops and services will accept U.S dollars, although the Bahamian dollar is the local currency. You will find ATM machines in local banks. The Marina at Emerald Bay accepts credit cards only, no cash. Driving on Exuma is on the left-hand side of the road, be sure to look right first before pulling out! There are few street signs, no center stripes, and no traffic lights. Speed limit on Queen’s Highway is mostly 30mph with a few posted stretches of roadway at 45mph. Beware lane discipline is not always observed on our many curves. How we say it – Cay, the Bahamian and preferred pronunciation is “key” from the Spanish word cayo, which means “low island or reef of sand or coral”. All terms, contents, information, and hours of operations are subject to change without notice. 16 November 2009.